I learned that I love paying taxes. I learned that the greatest joy is stopping by the market for lettuce. I learned that early sunsets and crisp November air make me happy, though I kind of knew that already. Two weeks from today we’ll be home with our adopted son. Two and a half years of paperwork and dreaming are almost over. I love paying taxes because I can. I love buying lettuce because now I’m a provider. In two weeks I’ll be walking home to my family. What I learned about myself today is that I’m ready to be a dad. The sweetest part of waiting is when it’s almost over. What did your protagonist learn about himself or herself in the chapter you just finished? Was it something big? If so that’s good. Was it was something small? If so that’s even better. A journey is made up of steps. So is a story. Each step in a journey brings with it a revelation. Unfortunately, not every scene in every manuscript does likewise. The meanings in many scenes are missing. Focus on your latest chapter. At its end, what does your protagonist or point of view character know about himself that he didn’t before? What does she see about someone else that formerly was hidden? What dilemma brings defeat? What uncomfortable truth is closer to the surface? How will the reader know? To uncover the meaning in a scene, search not for what is big but instead for what is immediate. Character arcs are often set up and resolved in a few steps. A big reveal or cathartic climax are fine enough but a many-part unfolding holds our attention for longer. It’s the small, immediate insights that give literary fiction its air of hyper reality and lend to commercial fiction a literary weight. Is it too much to pack personal insight into every scene? I’d say to leave it out is to do too little. Small steps add up to a journey. There’s even meaning in lettuce if you look for it. When you find it, it’s gold. Pick it up. Give it away. The journey is for sharing. Donald Maass is president of the Donald Maass Literary Agency in New York. His agency sells more than 150 novels every year to major publishers in the U.S. and overseas. He’s the author of several craft books for writers, including the highly acclaimed Writing the Breakout Novel and The Fire in Fiction. He’s also about to become a dad. Previous article: Facebook Group = Oprah Sensation? Thank you; your insights are pure gold. How beautiful! Congratulations! May we all find such glory in the present moment. Just wrote another 1000 words of my NaNoWriMo quota, had a break, read this post. Lovely news about the adoption. To be a father is the greatest joy I have ever had, and will ever have. What I love about your posts is how crystal-clear your messages are. I’m always inspired to look at my writing a little more closely, and in a different way. Thank you! And many congratulations on your new son. Great insights. Thanks for sharing them. And congratulations on the fruition of what I’m sure was a long and painful process. Always, always, the BEST articles on writing. Thank you. And congratulations on fatherhood… your baby boy will enrich your life a thousandfold. Enjoy the ride! Great, great advice I’ll take with me as I revise. I’ll be sending you and your family many well wishes and prayers this month. First, congratulations on becoming a father. Parenthood is a great joy and I’m sure your little one will be a constant source of it (among other things ;-)). Next, thank you for the excellent and insightful post. Congratulations on becoming a dad!! This gave me the goose bumps and I’ll be thinking of it all day! And I agree 100% with Maureen: your posts are always so clear and concise yet packed with wisdom. Much appreciated as I digest about a dozen blogs before starting a very busy day. A) What a great post, and B) Congratulations!! Thanks for sharing your love of small moments, that joy will also get you through the harder parts of being a parent. Congratulations! From one adoptive parent to another: congratulations! It’s an incredible journey. And thank you for another great post. As always, it’s a keeper. That is wonderful news on the new addition to your family. What beautiful words you had to share, as well. What fantastic news! Agreed that sometimes it’s the small quiet moments that leave the most indelible impression, both in a novel and in parenthood. CONGRATULATIONS! Congrats on becoming a Dad – you’re gonna LOVE it! Lots to learn about yourself with that job. Like this Author job of ours that you continue to shepherd us through – thanks for sharing your wisdom on including the most important stuff in our characters – otherwise, what’s the point, right? Great post, Donald, written with your usual clarity. All my best wishes as you embark on the fantastic journey of parenthood. Missed you in Surrey, but if you had to miss SiWC, oh what a fabulous reason to miss it! Congratulations! Congratulations! Wishing you many more days of abundance; there are few better ways of getting there than by holding a child’s hand. And as always, thank you for the writing information and inspiration. Congratulations. May you have pure joy and an ability to work in a sleep-deprived state. 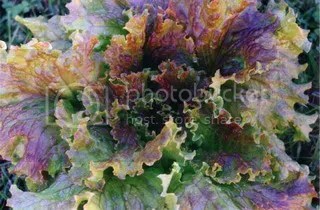 Note to the webmaster: Your picture is of decorative kale, not lettuce. I like the notion of searching for what is “immediate” rather than “big” in the scenes we write — that makes a lot of sense. I can’t wait to try it on my characters. Congratulations! What wonderful news, and also wonderful advice for any storyteller. What I’ve found is that there is absolutely nothing quite like parenthood to slow the world down, make you appreciate each tiny moment–and discover something new about yourself and about life in each of them. Thanks so much for sharing your good news! It adds perspective to your writing advice as well. As a poet writer, I have always found that it is the little things that make a difference, the every day! The little people, son and daughter, now in their early 20s, have always added so much to our lives and I am so proud to see them pursuing their own directions now. I learned today that I am the same person I was yesterday, and the day before that, and … I’m not only okay with that, I rather like it. Wonderful, graphic examples of show don’t tell. Wow! Congratulations! How very exciting. You insight is, and always be, transforming for me. Thank you. What wonderful news. When I was 4 my parents adopted a 2-year-old boy, my brother. Decades later, I continue to learn about love from him. Today’s his birthday. You describe the books I want to read. Congratulations, Donald!! What joyous news. My sister has two children – both adopted from Guatemala. My brother has two children – twins adopted from an orphanage in Russia. I am Guardian for the twins, and the little girl’s godmother and I wouldn’t trade them for the world. You’ll look at the beach in a totally different way, examining shells and dead jellyfish. Ants and bees become fascinating. It’s a whole new world through the eyes of a child. Revel in it. Wonderful post, and many congratulations on your adoption! Wonderful news, Don (and Lisa)! Enjoy each moment. How wonderful! I’m happy for you. I’m on the same journey myself and yes, the paper work is a killer, but I’m told it is so worth it. I hope you’ll update us when your son gets settled in. Again, congrats.